Welcome to the new CFN UEC Website. A work in progress, this is your direct user link to CFN. 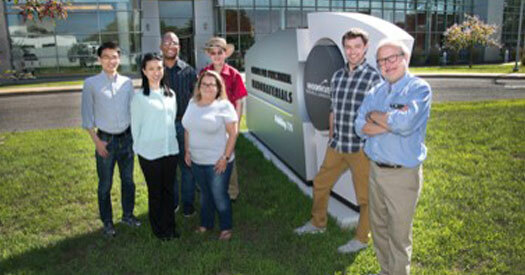 Appearing on this page is a photo of some of the members of our current UEC standing in front of CFN. A complete list of UEC members can be found at the Members link. We plan to provide highlights of recent research by both Staff scientist and general Users at CFN, a couple of which are listed below. We will also use this website to keep you up to date on developments at CFN including lab and equipment status, upgrades and new capital purchases. Recent work from CFN user Professor Emily Cranston from McMaster University was published recently in the high-impact journal Nano Letters. The work shows how an engineered but biocompatible nanocomposite can be used to direct the growth of muscle cells. Controlling tissue growth is of enormous importance in medicine, especially for the process of generating synthetic tissues. Here, the researchers combined a biocompatible hydrogel (a water-containing polymer network) with cellulose nanoparticles, which are naturally-derived from wood pulp and inherently biocompatible. Because the needle-like nanoparticles can be oriented in a magnetic field, the anisotropy of the entire nanocomposite and thus its mechanical properties can be tuned via the preparation conditions. In this work, these scaffolds were used to show that precursors to muscle cells (myoblasts) can grow inside this network, and thereby form muscle fibers (myotubes) that are aligned with the network. This points towards the ability to control directional cell growth, which is crucial for developing synthetic tissues. Published in Advanced Optical Materials, CFN scientists Chang-Yong Nam and Aaron Stein have developed a new synthesis strategy for assembling wide-area arrays of oriented, polycrystalline, ultrathin ZnO semiconductor nanowires. Semiconductor nanowires have useful properties for high-performance sensors, such as large surface area per volume that allows a much more enhanced interaction with environments. However, one persistent challenge for these materials is the difficulty of device integration. The synthesis strategy here exploits the gas-phase, vapor precursor infiltration into lithographically patterned polymer patterns, so that the resulting wire arrays are generated with full control over location, size, and thickness. The team fabricated high-performance ultraviolet (UV) optical detectors, which show ultra-high photocurrent on-off ratios (10^6) and the lowest dark-current levels ever reported for ZnO detectors (~1 fA) – characteristics likely stemming in part from the wire nanocrystallinity.